The newly openend Metro Station is rapidly transforming this area of Culver City into a busy retail and mixed-use hub. Our proposed infill project will connect the surrounding mixture of single-family homes, offices, retail, and light industrial sites through a central community park. 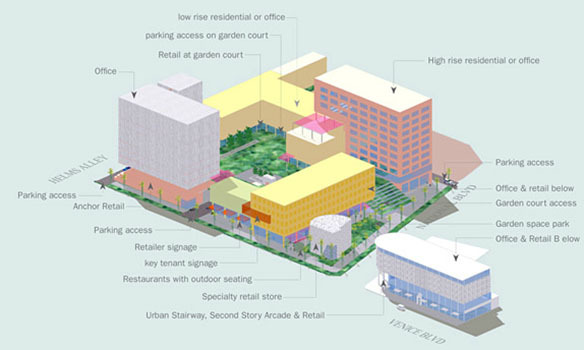 This communal open space will strengthen the urban connections between existing sidewalk retail and the proposed transportation node, while providing high-density, yet light-filled housing intermixed with a combination of retail and work spaces.